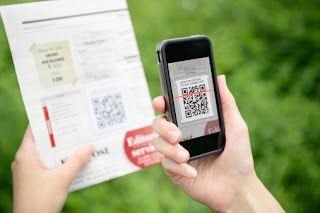 In today's world, one of the single best opportunities that you have to leverage the power of both digital and print campaigns at the same time is with a well-placed QR code. Short for "quick response code," a QR code operates on the same basic concept as a barcode, but can be used to accomplish a host of different things given the circumstances. If your goal is to use QR codes in your print campaigns creatively (as you should be), there are a few key avenues you can choose to pursue. If you're only using QR codes as a substitute for a hyperlink, you're not coming close to unlocking the benefits of this technology. Consider the example of a restaurant that uses QR codes for customer education. There's only so much information that you can fit on a "take home" menu before it starts to get unwieldy. The larger that menu is, the more likely it is to get thrown in the garbage because it's difficult to store long-term. If you were a restaurant owner, you might include an abbreviated menu featuring just items that are available to carry-out as a print marketing material. The QR code on that same menu, however, can be used to instantly educate the user about what your restaurant looks like, what items you have available for dine-in visitors and more. The physical print information that the customer is receiving is contextually relevant, in that dine-in options aren't necessarily on their mind if they're looking to order in. However, they do have access to all of that additional data should the need arise. The customer has everything they need to order in and stay home for the evening if they choose, but you're also using the opportunity to show them what a great time they'll have, and what a great selection they'll be exposed to when they do decide to pay you a visit. More than that, you're saving physical space on your material and are leaving contextual information in the digital realm. This is the power of a well-placed QR code at work. Another great way to use a QR code in your campaign has to do with adding to the experience before, during, and after the event. As previously stated, a QR code should be about delivering quality information to your customers. In the days leading up to an in-store event, for example, a QR code on the print mailer that you send out may automatically send relevant details about who is going to be there, why the customer should come, and more to that person. After the event, however, you can update what that QR code actually does to redirect the user to photos, video and other multimedia elements that were captured while the event was going on. Did a speaker host a question and answer session during the event? Suddenly, that same QR code can be used to deliver all that content right to the user's smartphone to let them relive the experience (if they were there), or show them what they missed (if they, unfortunately, couldn't make it). Now, you don't have to send out another print mailer with updated information because the QR code itself is inherently malleable. It can be whatever you need it to at any given moment with a few quick modifications. A well-placed QR code can do wonders for combining the best parts of both print and digital campaigns together. More than anything, however, it gives the user a choice regarding how they want to view the information that you're trying to get across. It allows them to pick a forum for the receipt of this data, allowing them to gain exposure to your message in the format that matters most to them.